When the European towing brackett manufacturers such as Bosal and Brink (now Thule Towing Systems) began selling into Britain they introduced to the mass UK market swanneck towbars (either with a welded or bolt on neck). The swanneck towbar is the norm in most continental European countries such as Germany, but every year they become more popular in the UK. When refering to a swanneck towbar we would not normally include detachable swanneck towbars, for more information please see our detachable towbars pages. 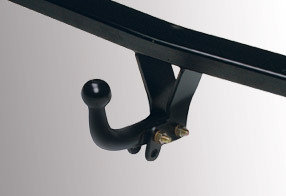 Different types of neck are used with flange towbars, depending on the make of towbar and design of the vehicle. But all allow a standard towball (with the rare exception of four bolt flange towbars) to be fitted. Long reach towballs or commerical pin and balls can also be fitted.